Rarely am I speechless. Rarely can I find the words to describe food. 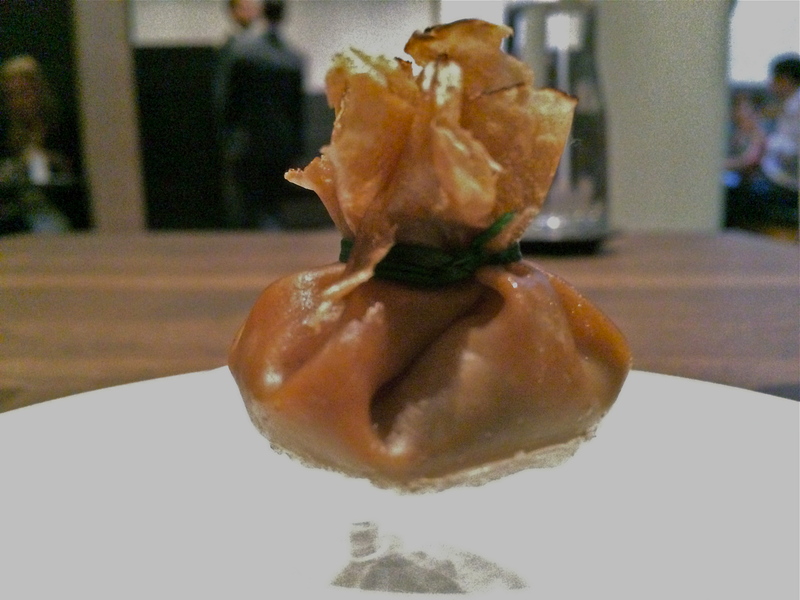 But when I stepped into Benu, a restaurant that combined Asian flavors with European techniques, I immediately knew it was going to be a rare experience. After attending the Investigative Reporters and Editors Conference in San Francisco, I needed a food fix. 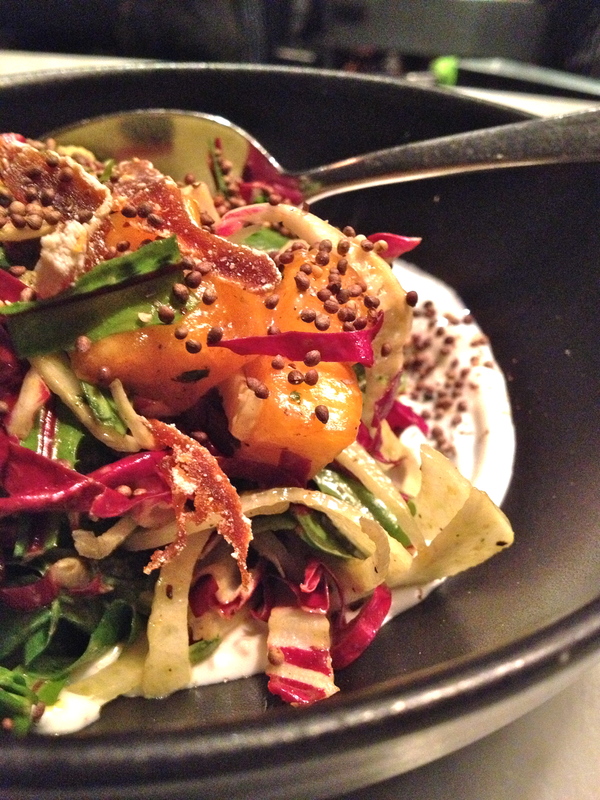 Benu, located in a historic building in the SOMA district, only took reservations. But like most journalists I had to try to get in, and so I walked to the restaurant and asked if they had any cancellations. Keep in mind most places like this offer fine dining and a price fixe menu but they don’t cater to just one person. There is no bar or lounge and no solo seating. But the Benu manager said “let me see what I can do.” While I thought there was no way I was going to get into this coveted 3-star Michelin restaurant, the staff whispered back and forth for several minutes. Soon, and to my surprise, I was whisked to a table, set for one in a dining room with dark wood and grey and black walls. Only a few simple art pieces hung on the walls ensuring there would be few distractions from the food experience. I bubbled with excitement not just because I got a seat at this restaurant, but because I was going to be there for hours. Yes – hours of pure indulgence, because what awaiting me was a theatrical performance of service and food presentation. I wasn’t intimidated by the price – $195, but I had to pace my stomach. Why? Because 18 courses awaited my taste buds. Some of them were just bite-size explosions of flavor but others were substantial portions on the plate. Knowing the price tag, I savored every bite. I’ve been to several high-end restaurants with interesting combinations of flavors, but rarely have I had an experience like Benu, where I couldn’t find words to describe the food. After several courses I realized I was tasting food that this Midwest girl had never had before, so there was no frame of reference to convey flavors, ingredients and spices. Luckily staff was there to assist in describing the ingredients and how they were prepared by Chef Corey Lee and his team. While each of the 18 courses was unique, there were several standouts that showcased the chef’s creativity and skill. 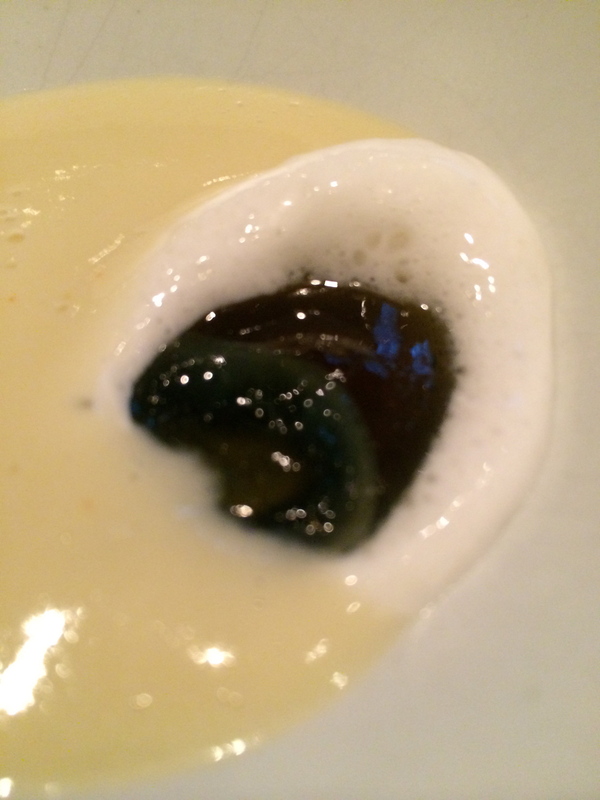 The night started with a thousand-year-old quail egg, potage with ginger that had an undescribable yet enjoyable flavor with a silky texture. The surprising dish of the night was the “beggar’s purse of treasures from the oak,” a pouch of earthy juices and flavors that combined truffles, mushrooms, egg yolk and Iberico ham that melted on the tongue. They presented this on a glass disc that was flipped into different shapes as the courses progressed. Often times the food appeared to be floating above the plate. Nestled in a fish boat, salmon roe, eggplant, buckwheat and perilla resembled an abstract painting more than another course. The buckwheat cracked with a crunch like cereal in my mouth. A hearty helping of wild summer salmon with cherry and sour cabbage, reminded me a bit of the Northwest. 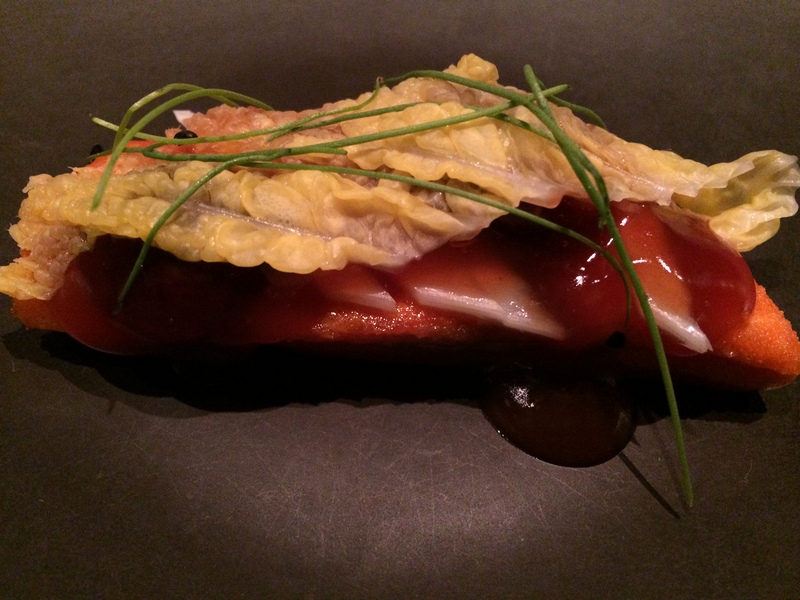 The salmon was cooked perfectly to medium rare and the cabbage provided a contrasting texture. 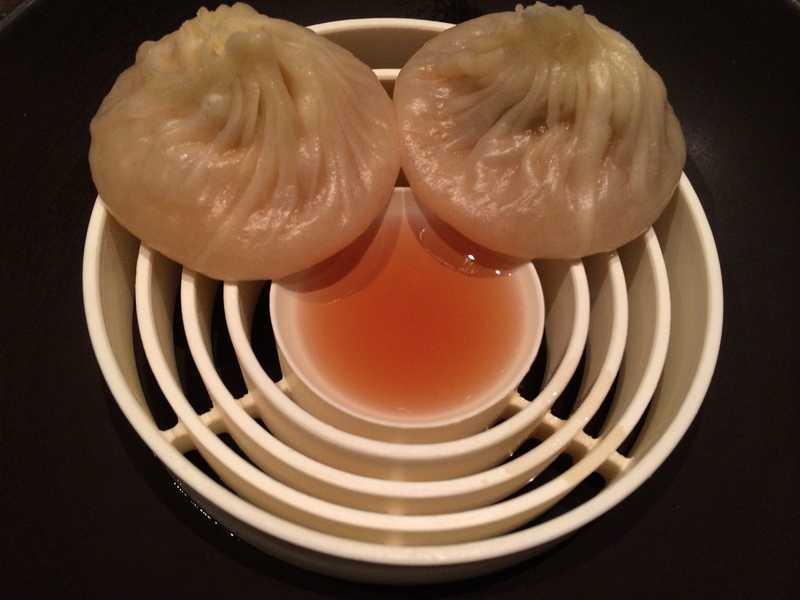 The lobster coral xiao long bao was memorable with its feminine paper-thin pockets of pillowy liquid lobster broth disintegrated in my mouth instantly, with no need to chew. And then there was what I like to call – lick the bowl moment – when I sipped the faux “shark fin soup,” with dungeness crab and Jinhua ham custard. An unidentifiable smell hovering below my face, with the broth having numerous ingredients including chicken, garlic, ham, ginger and carrot. 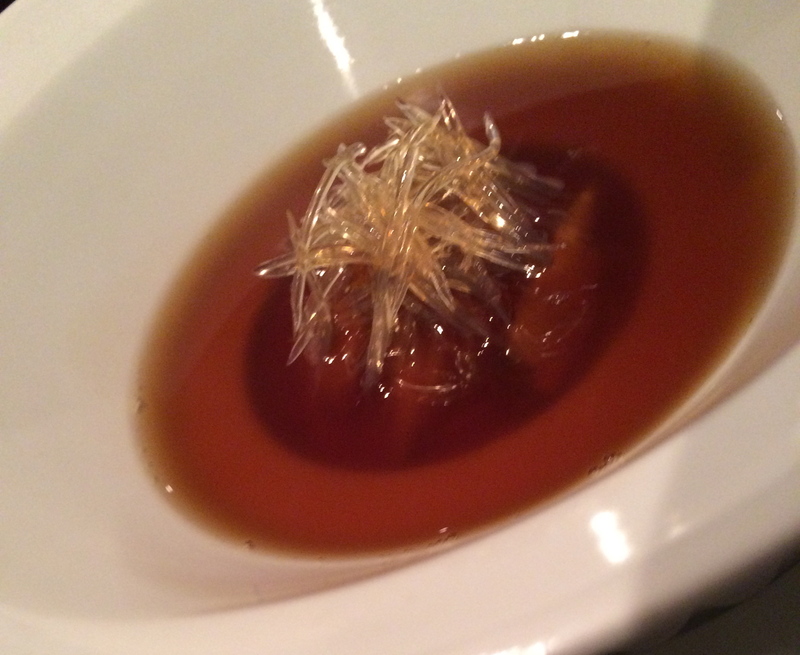 But the texture of the Jinhua ham had a remarkable, creamy texture that I’d not experienced. The server said they finely grade the ham from eastern China while it’s still frozen to create the texture. In the end out of courtesy for other guests, I refrained from licking the bowl. I stayed away from adding the beverage pairing for an additional $150. Instead, I relied on the sommelier to choose just a couple of beverage pairings that would last the evening and hold up to multiple courses. I started with a glass of Chablis for the first few courses, then a bone-dry Junmai sake with flavors of lychee and unripened Anjou pear. I completed the night with a Pinot Noir to match my salmon, roast quail and braised beef. 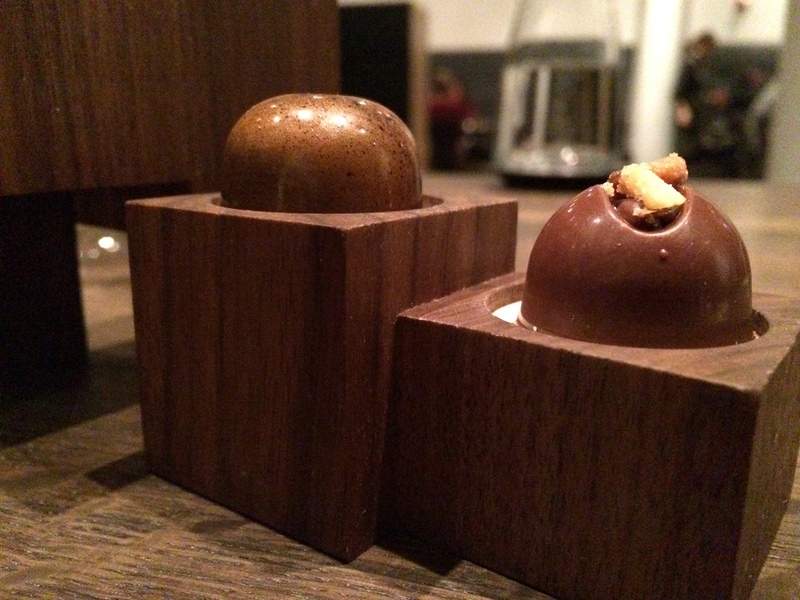 The night ended with a server opened and spun wooden boxes in different angles to offer hidden chocolate desserts. Not once during the evening did I feel uncomfortable sitting at my table alone. I walked out of the restaurant with a dreamy smile and a bulging, satisfied stomach. The exploration of flavors was worth the price. Posted in Food news, Hot Spot restaurants and bars and tagged asian, Christine Willmsen, dinner, lobster, price fixe, restaurant, salmon, San Francisco. Bookmark the permalink. Don’t take my word for it – okay do – but just look at how packed Joule restaurant is every night and you’ll know why I keep coming back to this fantastic fusion restaurant that is my new Solo Hot Spot. This unique restaurant shares space with The Whale Wins at 3506 Stone Way N., Seattle. As you walk through the front door the hallway literally separates the two chic restaurants. To the left you will find Joule encased with windows. The menu is diverse, with an emphasis on beef. 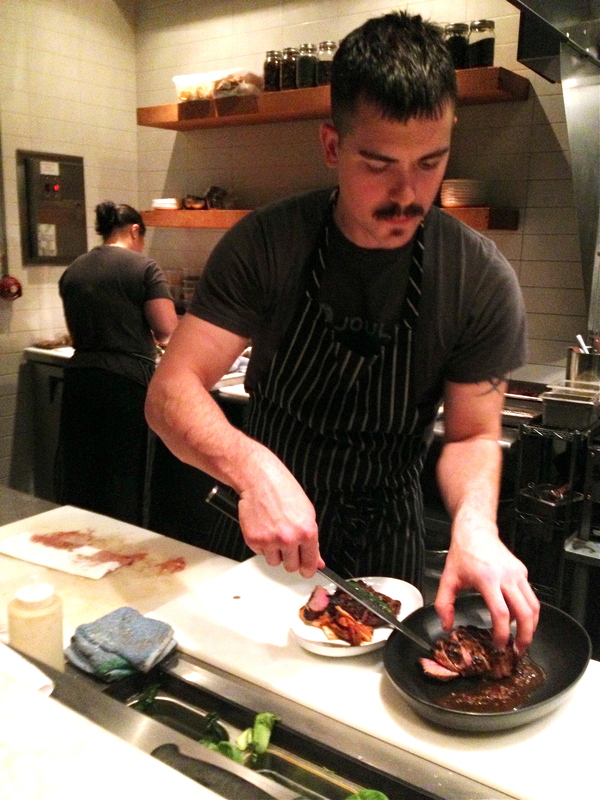 My favorite two dishes are the cold-smoked tofu made in-house and the duck pastrami with rice. 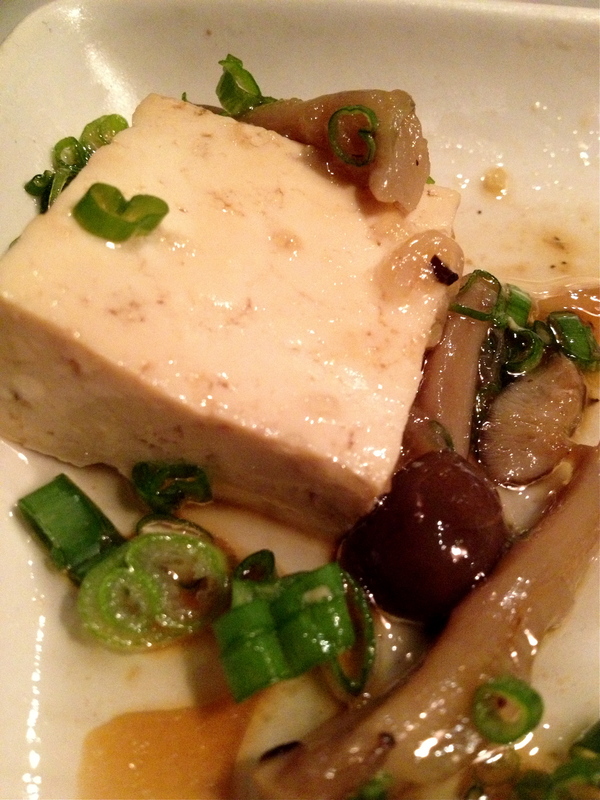 The $9 tofu is silky, firm and smoky and the Hon-shimeji mushrooms add a nuttiness and earthiness to the soy vinaigrette. 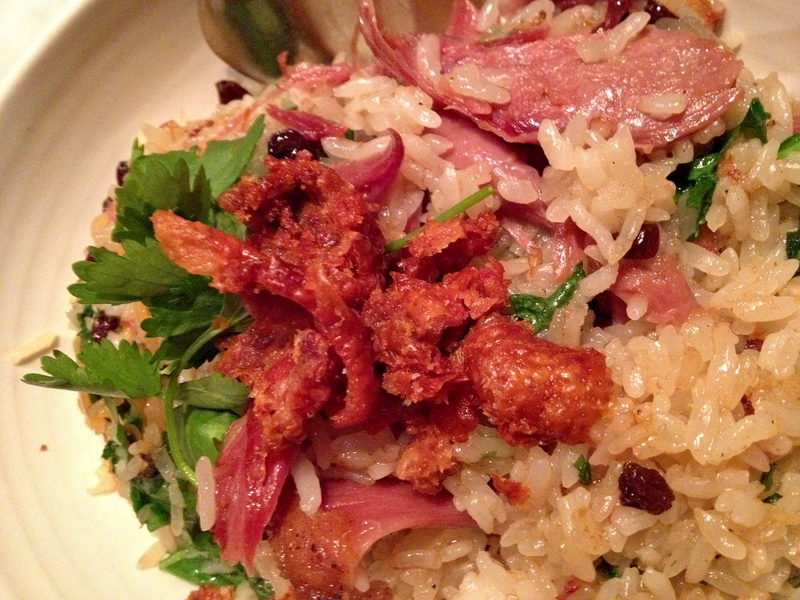 The $14 duck pastrami satiates the tummy with fried rice and pickled currant. The Seattle Times’ review states the kalbi-marinated steak is a must-order. Sally up to the chef counter, where there’s no reservations needed and is a perfect perch for a single person. Or if you are feeling social, try the communal table. The closer I am to seeing the food prepared and watching the talented chefs the happier I am as a diner at a restaurant. There’s something about watching chefs like owner Rachel Yang work their craft that totally relaxes me. 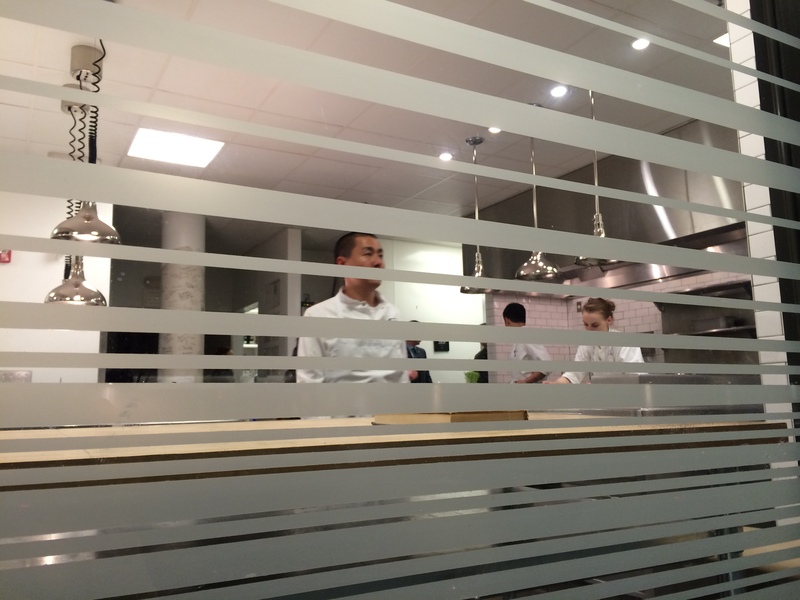 In this case I’m mesmerized by this open kitchen because the staff executes each dish flawlessly and effortlessly. The team functions like a well-oiled machine, quietly humming as they cook dish after dish with ease. At the counter you don’t feel alone and often you can spark up a conversation with the chefs or others sitting there. Yang and her husband Chef Seif Chirchi also own Revel restaurant, in the Fremont neighborhood and plan to open a third restaurant in Capitol Hill. Posted in Food news, Hot Spot restaurants and bars and tagged asian, beef, korean, restaurant, tofu. Bookmark the permalink.